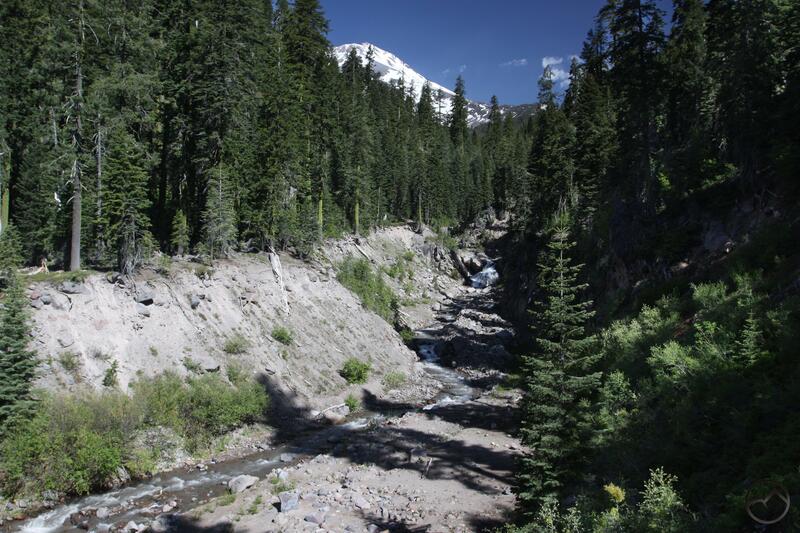 Mount Shasta gazes down into lower Mud Creek Canyon. 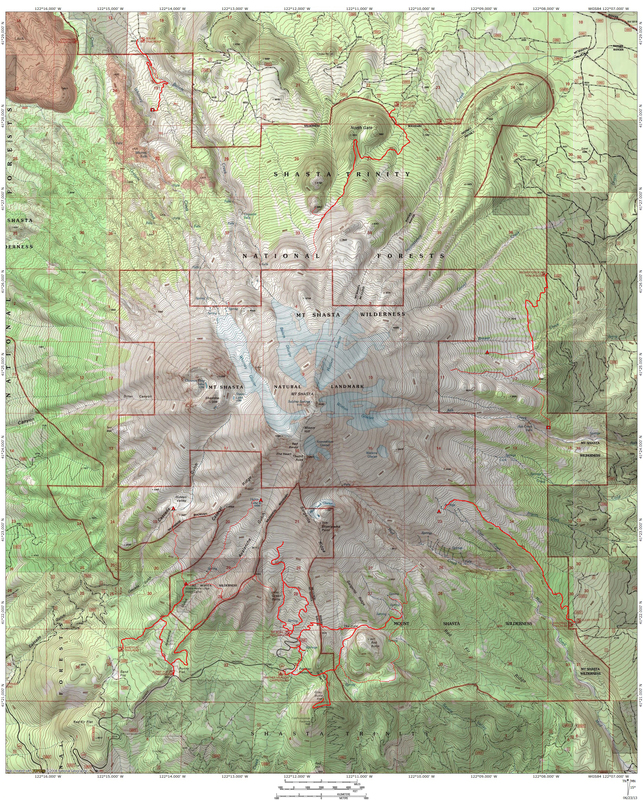 Mount Shasta is a mighty mountain with formidable geography. Its towering, icy heights soar far above everything else in its presence and much of the mighty volcano is cloaked in mystery to the average person. This is with good reason, considering the skills required to climb the high slopes. However, what comes as a surprise is the extent to which the mountain’s mystery extends to the lower flanks and obscures from view many sights that would normally attract hikers. This is the case with Ash Creek Falls, Diller Canyon and many, many other places that are quite easy to get to, if there was an awareness of their existence or their accessibility. This is the case with Lower Mud Creek Canyon, a lost gem on the southern flanks of Mount Shasta. 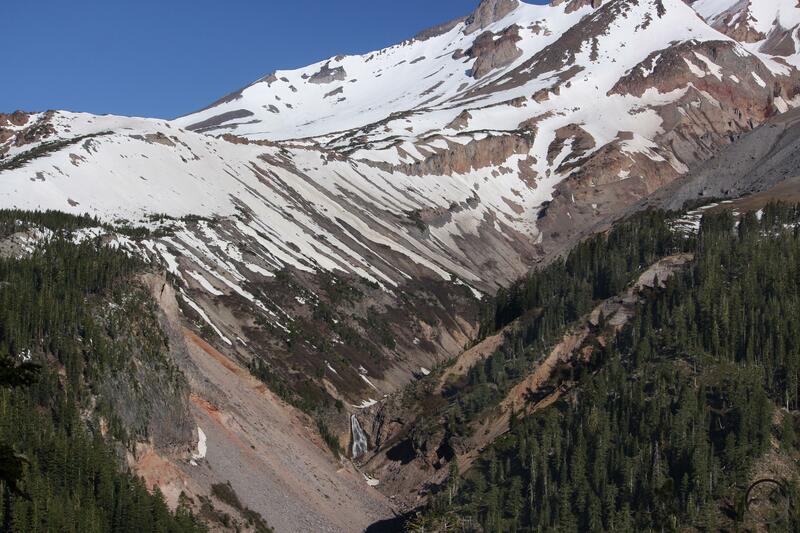 Mud Creek Canyon is easily among the most dramatic, spectacular features on Mount Shasta. If the mountain had been designated a national park as John Muir had advocated, the canyon would surely draw more attention and have achieved an iconic status. Even though Mud Creek Canyon languishes obscurity it remains one of the most staggering and stupendous natural wonders in California. Beginning high on the south side of Mount Shasta, at the foot of the Konwakiton Glacier, the canyon begins its epic descent down the flanks of the mountain. At its mouth, nascent Mud Creek pours several hundred feet over Konwakiton Falls. Below the waterfall the narrow canyon deepens considerably while the creek disappears beneath a layer of scree-encrusted ice and loose rubble. Nearly a mile below Konwakiton Falls the canyon widens and takes on the classice V-shape of the other gorges on the flanks of Mount Shasta. However, while the shape may be the same, the proportion is not. Rather than being several hundred feet deep like canyon siblings, this section of Mud Creek Canyon is well over 1,000 feet deep. Its scale is simply epic. The large V-shaped section comes to an end at an impressive band of cliffs where Mud Creek flows of its magnificent, eponymously named waterfall, the largest on Mount Shasta. Below the falls Mud Creek is joined by Clear Creek, which has just completed its own 1,400 foot descent down a series of awesome cascades. Below the confluence, the canyon takes on a more typical appearance with wooded slopes punctuated by occasional cut banks, though it is still nearly 800 feet deep. From here the canyon is lost from the public consciousness as its journey takes it beyond the sight of any trails. It does not emerge into view again until its journey is nearly complete and is crossed by Pilgrim Creek Road and Highway 89. Naturally most attention given to Mud Creek Canyon, scant though it generally may be, is lavished on the splendid upper section. The massive scale, staggering canyon and awesome waterfalls are naturally going to draw the attention of hikers. The lower canyon is utterly forsaken. Few people think to explore what possibilities it might hold and fewer still purpose to explore this lost section of canyon. What lies beyond the curtain of mystery is a fantastically scenic canyon. Mud Creek is untamed and raucous, the forests are deep and ancient and a vital sense of wilderness pervades the canyon. Surprisingly, it is not difficult to penetrate the unknown and enjoy the beautiful canyon. An old road once pushed into the wooded canyon and ran parallel to Mud Creek. The lower section of the road saw some logging activity a long time ago. Passed these areas the old run enters the Mount Shasta Wilderness and quickly degrades into what would more accurately be described as a trail. Though there are signs of recent activity they are minimal and it is obvious that the canyon has been lost to all but a mere handful of people. A large cut bank on Mud Creek. 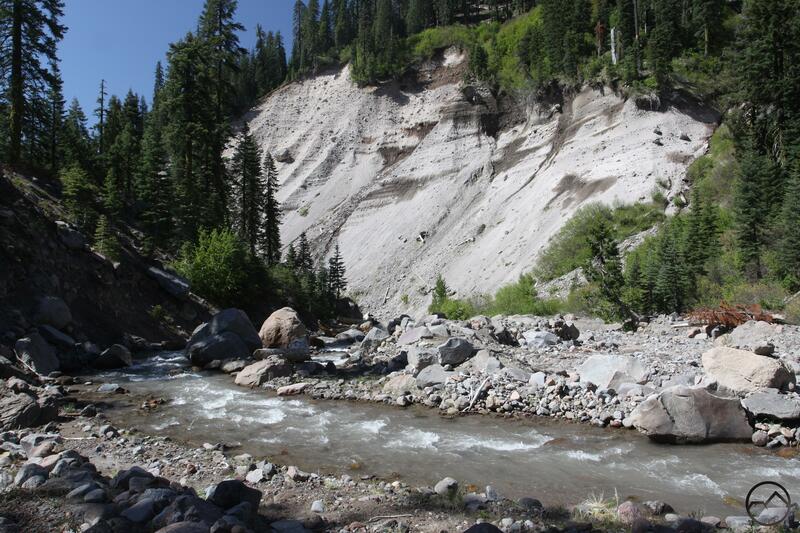 Without doubt, the most interesting feature in lower Mud Creek Canyon is Mud Creek itself. The creek runs all year and is, along with Squaw Valley Creek, one of the two largest creeks that begin on Mount Shasta. Its character resembles its distant relatives, the large rivers that rise full-grown from the glaciers on the Cascade giants to the north like Mounts Rainier and Hood. On those grand mountains, rivers such as the Sandy, Zigzag, White, Cowlitz and Puyallup Rivers emerge from their similarly named glaciers and flow off their host mountain. Like those river, Mud Creek begins its journey on the Konwakiton Glacier. Also like those rivers, its channel is wide and strewn with the detritus of Mount Shasta that has been carved off by glacial activity and subsequent erosion. 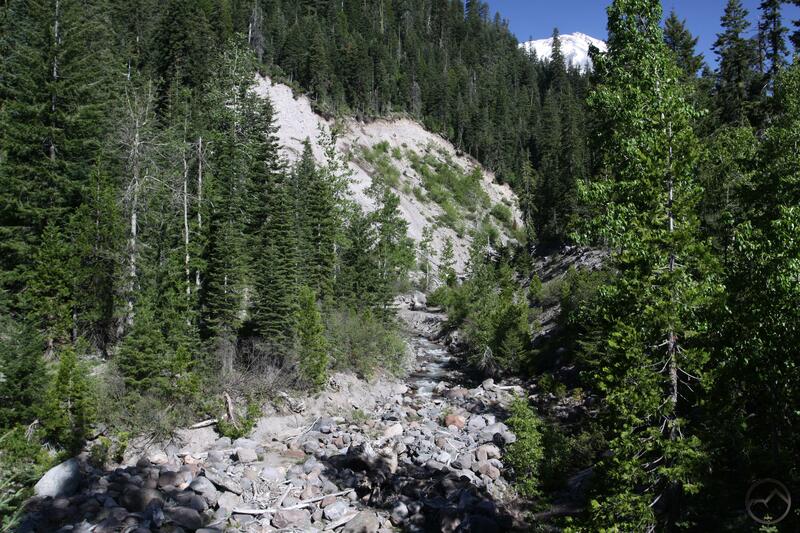 Also like those rivers, Mud Creek does not flow clearly and is clouded by glacial flour and other bits of Mount Shasta as it slowly grinds away at the mountain. While much smaller than the aforementioned rivers, Mud Creek is still a large creek and its channel is cut deeply into the canyon. In fact, the river has a secondary course within the primary channel. The main channel is 20-30 or more feet deep and composed of the boulders and loose silt Mud Creek has washed off of Mount Shasta’s higher flanks. Within that channel the creek winds and weaves its way through the rocks. Numerous cut banks add a rugged and evolving beauty to the creek and canyon. Mud Creek is quite wild and very attractive and its character is entirely different from the other large creeks in the Mount Shasta area. For this reason alone lower Mud Creek Canyon is worth exploring. Lower Mud Creek Canyon’s lost waterfall. The real highlight of journeying into the lower section of Mud Creek Canyon is the delightful waterfall hidden away in the canyon’s lost recesses. 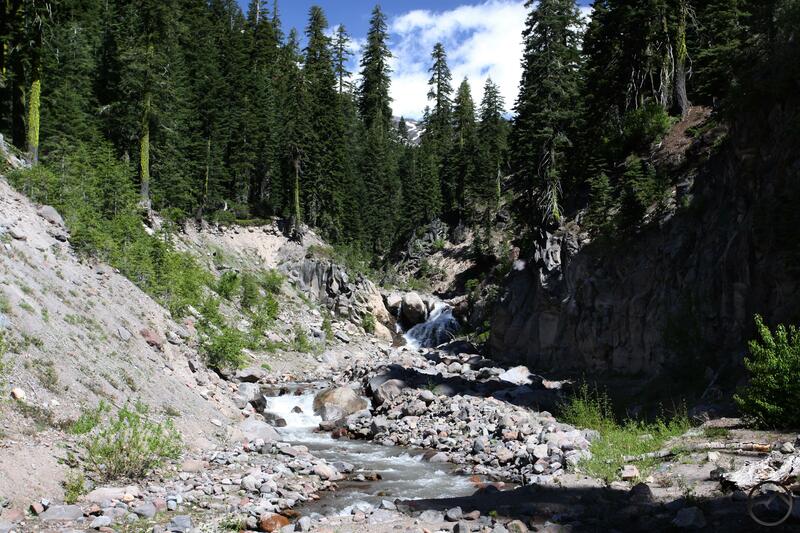 While there are several unnamed and unappreciated waterfalls on Mount Shasta, nearly all of them are at higher elevations, require long or difficult drives, cross country exploration or are simply inaccessible because of the terrain. Consequently, Mount Shasta is generally not thought of as a premier waterfall destination and several truly stunning waterfalls go unappreciated. 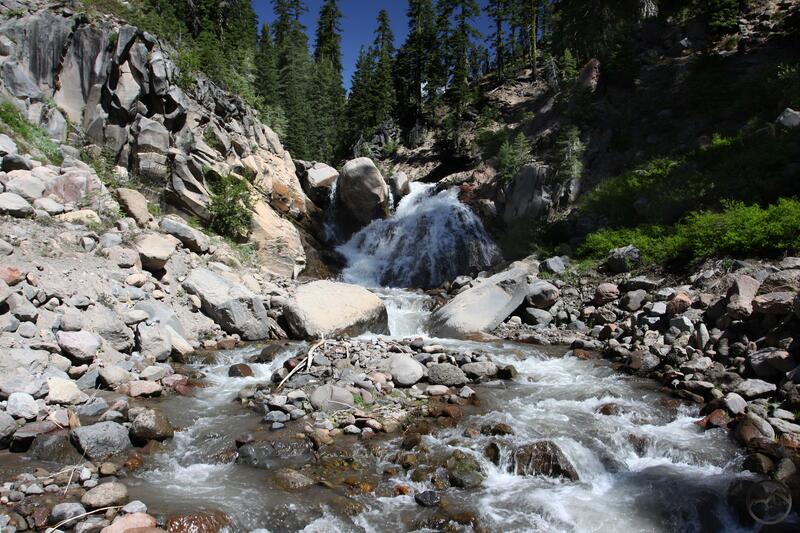 Ironically, the waterfall in lower Mud Creek Canyon is easy to reach and, while it lacks the height of the other waterfalls on Mount Shasta, is wonderfully attractive. Pouring over a hard, erosion-resistant bench, the falls shoot through an extremely narrow section of the canyon. The top of the waterfall is constricted by a trio of boulders, forcing the water to gush through a fairly narrow slot. A pair of smaller waterfalls spill through the gaps between the three boulders. Below the narrow upper section of the falls, the water hits the dense rock and explodes into a wide fan as it crashes into the rocks at the bottom. The entire waterfall is about 25 feet or so high. Not tall, but especially scenic and made all the more so by being thoroughly unknown. Shasta Red Firs surround Red Fir Falls. It seems fitting that the falls should have a name. The logical choice would be Lower Mud Creek Falls but this lacks a certain `elan. This falls is also very distinct in character from its sibling further upstream and fails to take into account the possibility of additional cataracts hidden in the deep recesses of Mud Creek Canyon. In fact, considering that the lost falls is more than two miles downstream from Mud Creek Falls, the two seem to have little to do with each other except for being on the same creek. Consequently, the “lower” appellation seems all the more inappropriate. Unfortunately, there are few other names in the area that would be fitting to adapt into a name for the waterfall. The only really viable option is nearby Red Fir Ridge. The wall that forms the west side of lower Mud Creek Canyon rises over 1,000 feet to a long ridge, which is the Red Fir Ridge. The presence of excellent old growth Shasta red fir throughout lower Mud Creek Canyon and especially around the falls makes the Red Fir moniker all the more apropos. Consequently, at least for the purposes of discussion on Hike Mt Shasta, the waterfall in lower Mud Creek Canyon is dubbed Red Fir Falls. Whether hikers are seeking solitude, a wild, boisterous creek or a great waterfall, lower Mud Creek Canyon is a fantastic destination and is begging to be explored and appreciated. As always, for those interested in learning the route to lower Mud Creek Canyon, send me an email and I will give directions. There are a couple of good cataracts up there but they take a bit more commitment to get to. Hi I would be interested in directions to the lower mud creek area. I’m always wondering what the most efficient route to the bigger mud creak falls might be that doesn’t require any climbing gear. Thank you! !